The citizens of the Fargo-Moorhead area have been plagued with criticism surrounding the prominence of excessive drinking for many years, but recent surveys suggest high-risk drinking for college students has been steadily declining for the past decade. The Daily Beast, a reporting and opinion website that launched in 2008, releases an annual survey with a list of the 40 drunkest cities in the United States with data about binge drinking, deaths, etc. With an average consumption of 12.48 drinks per month, the survey currently lists Fargo as the second drunkest city out of 40, falling just behind Milwaukee, Wis. Excessive alcohol use, as defined by the Center for Disease Control and Prevention, can be broken into two categories: heavy drinking (more than two drinks per day on average for men or more than one drink per day on average for women) and binge drinking (five or more drinks during one sitting for men or four or more drinks during one sitting for women). Administrative Lt. Tory Jacobson just completed his 20th year on the Moorhead Police Department, and he said he’s been part of many investigations dealing with excessive drinking. Lt. Jacobson said the police department aims to bring something positive out of these tragic situations to make more of an impact so students don’t think of drinking as a rite of passage. The rate of high-risk drinking has decreased from 39.1 percent in 2005 to 29.9 percent in 2010, according to a recent College Student Health Survey Report, which compiles data from Concordia and other colleges and universities in the state of Minnesota. Paul Wraalstad, director of student programming and facilities at Concordia, said the prevalence of alcohol in the community here has more to do with the culture of rural America. Suzanne Redekopp, a junior at Concordia, said she thinks alcohol use is tolerated more in North Dakota, as surveys suggest this area is among the first in the nation for binge drinking. Wraalstad views that excuse as a cop out, and he wants people to know that not everybody drinks. Talking about drinking is key, according to Wraalstad. Education is another important way to overcome biases about drinking. 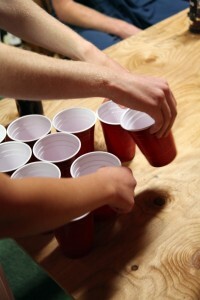 Problems with alcohol use plague other campuses across the country as well. Junior Laron Chapman from the University of Oklahoma in Norman said drinking has become a habitual practice by the majority of students on his campus. Chapman made the decision to consume alcohol before he turned 21 years old, a decision egged on by his peers executing subtle and informal pressure. Now that he is 21, that pressure is not as much of an issue, although the attitudes in his community surrounding the idea of drinking are laidback, he said. The University of Mississippi in Oxford is a well-known party school fueled by a large influence of Greek life. Junior Taylor McGraw said alcohol use is very prominent on campus. When McGraw was a freshman, he pledged into a fraternity, decided not to drink until he was 21 and dealt with social pressure to drink and drink often. “I was the only one in my pledge class of about 60 who didn’t drink freshman year,” he said. McGraw didn’t want to feel like he needed to drink to fit in or have fun before he turned 21, but now he said the peer pressure isn’t as prevalent. Oxford is a small town in Mississippi, and McGraw said religion plays a role in his alcohol attitudes. Cold beer cannot be sold in the county, and beer is not allowed on his campus. Bars close at 1 a.m. on Thursdays and Fridays and midnight all other nights. Alcohol sales are banned on Sundays, except for home football weekends. “In Oxford, football trumps the Baptist preachers,” he said. Julia Butler, a junior at Boston University, said the use of alcohol is prevalent on her campus. “Boston has one of the highest concentrations of colleges or college campuses in the country, and therefore there’s a lot of students here, and the majority of them drink heavily, or at the very least, on a regular basis,” she said. Unlike Concordia and the University of Mississippi, Boston University is not a dry campus. There is a campus pub, for people who are 21 years of age or older, and Butler said it is frequented by prominent members of the university’s administration. “I’ve had more than one high-ranking administrator take pity on poor, broke, college kid-me and buy me a drink,” she said. Butler said there was not much pressure for her to drink alcohol before she turned 21.